Perhaps you are one of those people who stop to read historic markers when taking a Sunday drive or a weekend excursion. If so, you are probably aware that these little bites of historical information abound in NH – 188 of them according to the state his torical marker site. They make for informative and sometimes colorful bits of reading. For instance, did you know that if you travel to Clarksville, NH and stand at the precise spot where Marker No. 115 is located "you stand on the 45th parallel, halfway between the Equator and the North Pole. At this point, you stand also at longitude 71 degrees and 24' west from Greenwich, England. A line from this point through the center of the earth would emerge in the Indian Ocean 982 miles southwest of Perth, Australia." What a great piece of trivia! It reminds me that when I was a child, I was told that if I would dig a hole straight down through the center of the earth I would come out in China. I was quite intrigued by the notion. In my child's imagination, I contemplated trying it, but was daunted, not by the big dig, but by not being able to speak Chinese when I got there. More importantly to us is marker #118 located on the grounds of the Gilford Firehouse proclaiming to all who care that the name of our town commemorates a Revolutionary War battle and that we are the only town in NH that does so! 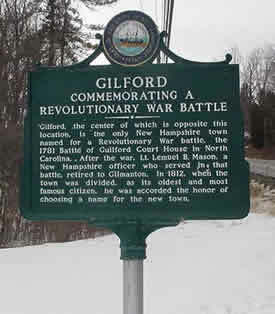 It reads – "Gilford, the center of which is opposite this location is the only New Hampshire town named for a Revolutionary War battle, the Battle of Guilford Court House in North Carolina. After the war, Lt. Lemuel B. Mason, a New Hampshire officer who served in that battle, retired to Gilmanton. In 1812, when the town was divided, as its oldest and most famous citizen, he was accorded the honor of choosing a name for the new town." After having looked at this sign a number of times with only passing interest, I recently found myself wondering just who Lemuel B. Mason was and why he chose to memorialize this particular battle by naming the new town after a battle fought in 1781 – more that thirty years earlier. According to Newington, NH: A Heritage of Independence since 1630 by John F. Rowe, Lemuel Bickford Mason was born in Newington/Durham, NH on Jan. 14, 1759. Lemuel was still a baby when his father, Robert Mason died in 1760. His mother, Susannah Bickford remarried in 1762. A circumstance that may not have worked out too well for Lemuel as thirteen years later when he was barely sixteen he enlisted in the newly formed Continental Army, soon after the Battle of Bunker Hill. The History of Durham states that he remained in active service for 8 years, until the proclamation of peace, having served for the entire span of the war. According to both town historys, he returned to Newington at the end of the war, and though named in his father's will, he found himself "penniless and despoiled of his inheritance". But Lemuel must have been an exceptional young man, eager to make something of himself. He was taught to read and write by his captain (possibly Capt Reid in whose company he enlisted) and became a military clerk and scout. In leading scouting parties, he had bullets put through his coat and hat but was never wounded. Mason had advanced to sergeant by the battle at Guildford Court House and left the army with the rank of lieutenant. In addition to the Battle of Guilford Court House, he participated in such battles as Trenton, Princeton, Monmouth and Stillwater. He was present at the surrender of Burgoyne at Saratoga, NY in Oct 1777 and served under Sullivan in the Indian Expeditions. In spite of all the service he had seen, apparently it was the Battle of Gilford Courthouse (now located inside Greensboro, North Carolina) that made the deepest impression on the young but seasoned 22 year old patriot. On March 15, 1781, the British under General Cornwallis with a force of 1900 men faced Nathanial Greene and 4400 American troops. The outcome of this encounter proved it to be one of the most decisive engagements of the war. Tactically the British were the victors, but the hard fought battle virtually ended in a draw. Green had divided his troops into three lines with militia in the first two lines and the regulars in the rear and backwoods riflemen on the right and left flanks to pick off the advancing British. Cornwallis's troops forced their way through the first two lines, but with heavy losses. By the battle's end the two armies were engaged in hand-to-hand combat. The British lost 600 men and Greene retreated with his men into the back country. Cornwallis declined to follow and in a few weeks he moved his troops to Wilmington to refit his depleted command. From there he went to Virginia, abandoning the southern states he had just overrun. Greene succeeded by hard fighting in recovering the southern states. One of the men serving under Greene was Lieutenant (then Sergeant) Lemuel B. Mason. Within seven months the war was over. Above information from Wikipedia Free Encyclopedia and "New Hampshire Town Names"
Mason, then about 24, returned to Newington in 1783 and from there he moved to New Durham Ridge where in 1786 he married Mary Chamberlain. Together they raised thirteen children. Establishing new towns was not new to Mason who signed the petition for the new town of Alton in 1788. While there , according to the Alton History, he served as a selectman for several years. Adair Mulligan states in The Gunstock Parish, that in 1797, while living in Alton, Mason bought Governor's Island for $1200 from John Langdon. The Alton History records the sale of Governor's Island and Rattlesnake Island by Mason and his wife in 1800 to his sister-in-law's father Eleazer Davis father of Nathanial Davis, well-known and colorful resident of Governor's Island. At some point between 1797 and the early 1800s, Mason moved to Gilford, then the Upper Parish of Gilmanton where he was living in 1812 when he was given the honor of naming the new town. Mason and his growing family lived for many years in Gilford, While living in Gilford he found himself back in the service of his country, having received a commission as captain in the War of 1812. He received a justice's commission in 1838. Thanks to Susan Leach of Gilford and Gail Pare of the Newington Historical Society for information about the life and career of Lemuel Bickford Mason. If you are interested in viewing information about New Hampshire's historical markers, visit www.nh.gov/marker/index or The New Hampshire Division of Historical Resources.